Boxcutters, Jigger, Shaker Classic/Boston, Citrus Juicer, Strainer, Martini Glass. 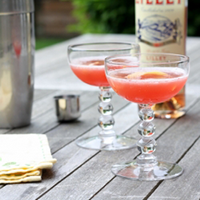 Add Rye, Grapefruit Juice, Campari and Lillet into a cocktail Shaker. Add ice, and shake for about 30 seconds. Strain and pour into a Martini Glass, then serve with a Grapefruit Twist.